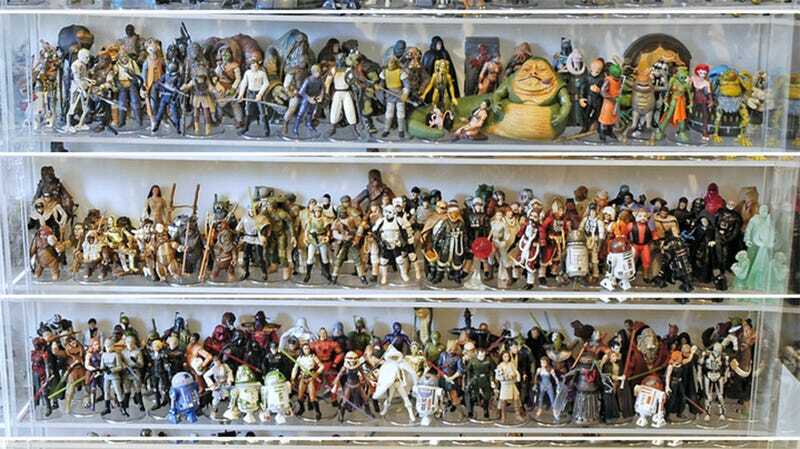 Collecting nearly 2000 Star Wars action figures the hard way would have taken thousands of dollars and decades of work. The easy way is to let someone else do it, then buy their collection straight off them. If that's more your style, the Star Wars museum at Rancho Obi-Wan are auctioning off a lot of 1950 figures, a tally that constitutes "nearly every Star Wars action figure ever produced... (100% of the 1978-85 series is here, and nearly every subsequent figure produced to early 2011)". The market value of such a collection has been valued by an expert at over $8000. If that's not enough to get you bidding, know that the funds will go to help keep Rancho Obi-Wan—a not-for-profit establishment—running. Oh, and that they all used to belong to Fon Davis, a former model-maker at ILM who's worked on six Star Wars movies (the prequels and the original re-releases). You can see some money shots of some of the figures in the gallery above.